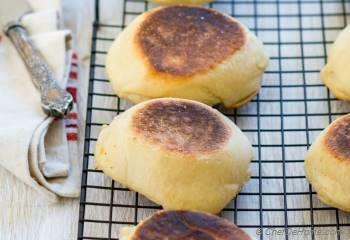 Easy and fluffy fresh baked English Muffins for homemade breakfast? Are you excited for this idea because I'm so excited to share with you how much I enjoyed these English muffins for breakfast last weekend. Often when I adapt from a recipe, I love to add my twist to it because that's what makes it personal for me. But these muffins are so simple... I decided to change nothing. 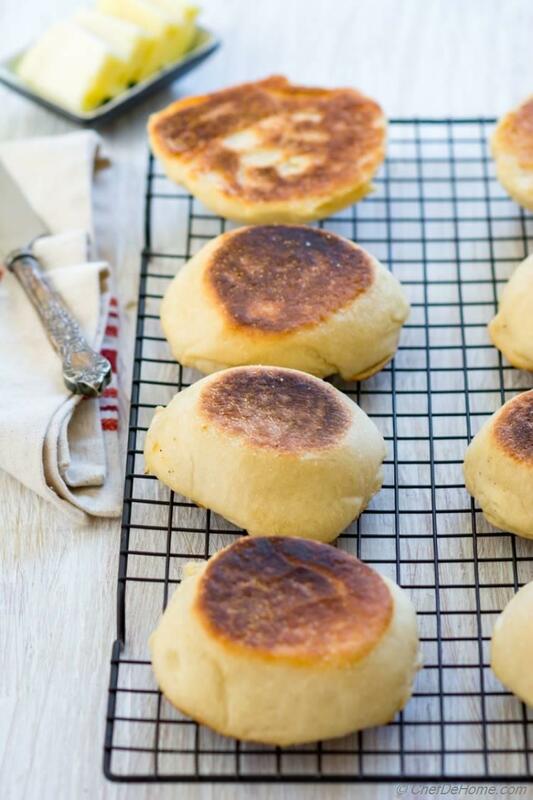 You won't believe that 6 simple pantry-ingredients make the best tasting and fresh English muffins! With this recipe, I'm also sharing review of my new favorite, James Beard Foundation Book award winner, bread cookbook - The Bread Baker's Apprentice, by Peter Reinhart. 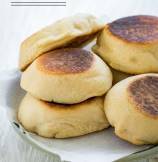 I'm sure you can guess, I decided to test a recipe from the cookbook - English Muffins, to share honest opinion about it. Now, ultimate test of a good cookbook is good recipes. There is no better way to tell that than trying an actual recipe from the book. Last weekend, I wanted to bake bread for breakfast and started flipping pages of this book for some inspiration. During this time I marked various recipes to try later but my search stopped at page 163 with English Muffins recipe in my site. 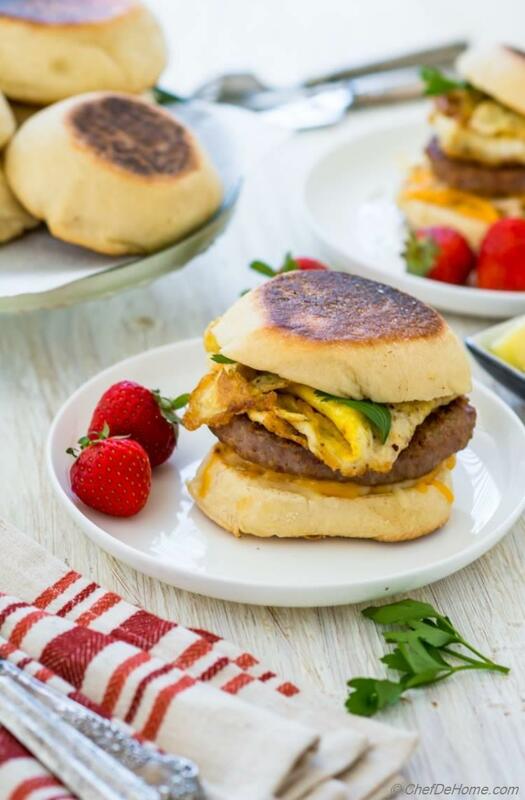 Just meant for a homey weekend breakfast.. who will say no to comfort of toasted fluffy English muffins topped with turkey sausage and eggs?! Overall, it is a great cookbook for anyone who loves baking breads. Especially at this time of year when baking is in full bloom.. (thanks to fabulous holiday season) … it is a gift from baker's heaven. 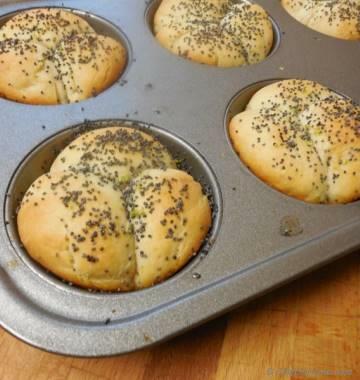 Book offers a variety of recipes with potential to try a lots of homemade breads. Bread loafs such as classic San Francisco sourdough loaf, flat breads such as focaccia, breakfast & snacks such as bagels, pretzels, English muffins and sweet breads too which are in my to-try list next. 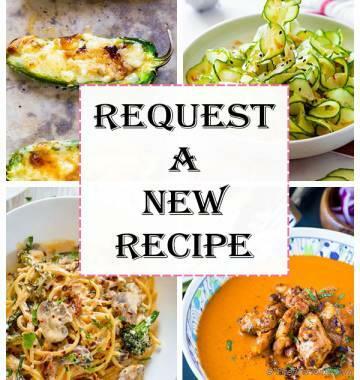 The recipes are so easy to understand and use ingredients that I can easily find… mostly in my pantry or any grocery store. I like the fact that it is very well organized with one section to introduce basic dough and bread-baking techniques. I really liked this bonus information. My most favorite tip was - 'Windowpane Test' to check if bread dough has been kneaded well. You know how important it is to knead the dough to develop gluten in bread?! Learn this one technique and never mess-up again. I'm going to use it for all of my future bread baking. I wanted to make muffins at home since long! I had some idea for english muffin recipe but feels like I was just waiting to own this book. :) Also, recipe uses instant yeast and can be treated more like focaccia dough. This made my choice even easier. Muffins are cooked in skillet and then finished briefly in oven for cooking through which was suitable for my Saturday morning breakfast style! 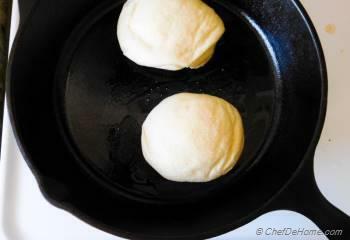 As soon as muffins hit the pan, kitchen was filled with aroma of fresh cooking bread. 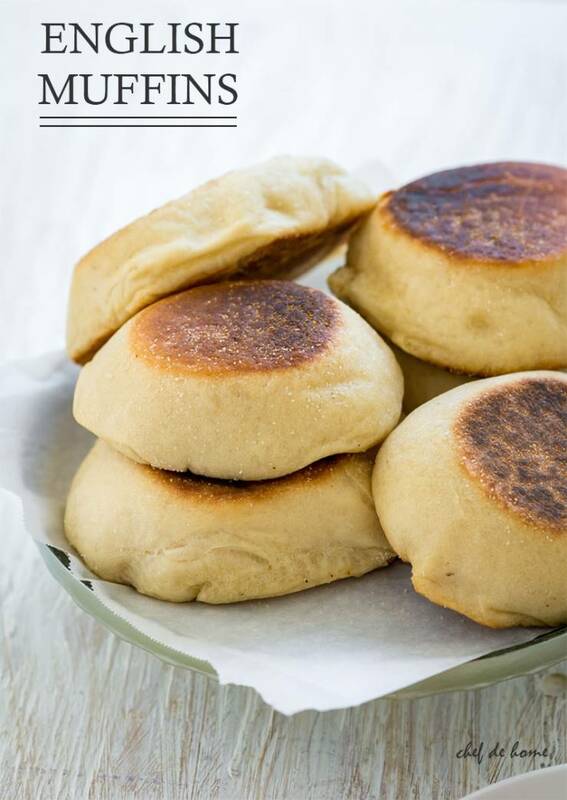 English Muffin ingredients are so simple you will have them right now in you pantry. Plain old AP (All purpose) flour, instant yeast, milk, oil, salt, and tiny bit sugar. 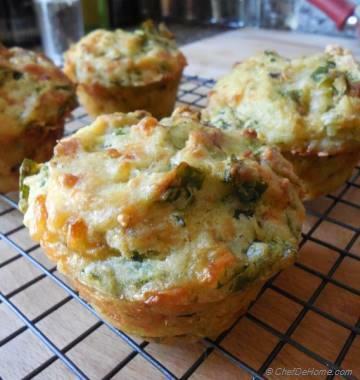 Oh yes, just these few ingredients and you can enjoy homemade muffins for breakfast tomorrow. Oh, and the ingredients remind me to tell you that you can also use butter milk instead of milk for this recipe (as was suggested in the book). Also, if you are in mood of vegan breakfast? then replace milk with coconut milk/almond milk. I have only used oil in dough and pan-fried muffins in oil instead of butter. So, just replacing one ingredient will make English muffins vegan. Use a vegan sausage and egg-replacement to serve a sandwich like this one. I kneaded the dough while making morning tea. By the time I finished cleaning etc. 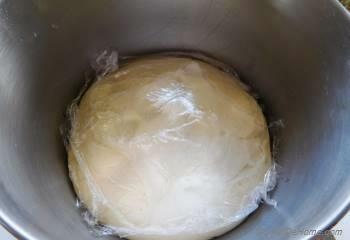 dough is ready for second rice. Recipe suggested to divide the dough into 6 halves which yield 6 muffins. I was kinda greedy so I divided the dough in 8 muffins. Next time, I will divide the dough in 6 parts only since that will make muffins even more fluffy. 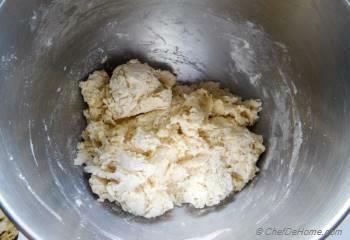 I roll each portion of dough into small round and tuck the loose ends beneath for an even muffin finish. I finished muffins in the oven at end for quick 7 minutes. Voila! Fresh baked muffins out of the oven for a delicious English Muffin Breakfast! Loved them! Finished more than half by calling it a brunch ;-) So this book has passed my test and these muffins are proof... my mouth is watering and I can't wait to try few more recipes..
Smart Swap Use half whole wheat and half AP flours for more nutritious muffins. 1. Add flour, sugar, salt and yeast in a bowl of electric mixer. Stir in oil, and milk until ingredients for a bowl. Line a large sheet with parchment and sprinkle with semolina/corn meal and set aside. 2. 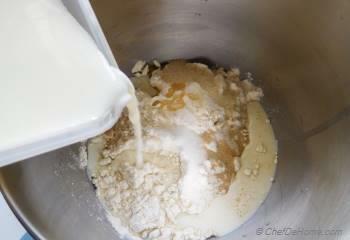 If there is loose flour in bowl, add little more milk until dough comes together. It should be soft and tacky. 3. With dough hook attached, knead the dough on medium for 8-10 minutes sprinkling more flour as kneaded to tackle the dough. 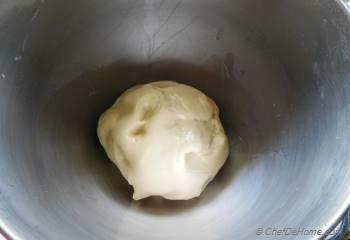 Lightly grease a large bowl with oil, add the dough ball and cover in oil. 4. Cover with plastic film and let rise at room temperature for 1-1.5 hours. This is what it looks after 1.5 hours. 5. 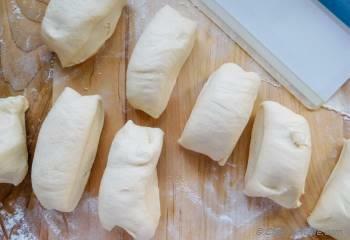 Transfer the dough to a work board, divide the dough into 6-8 portions. 6. 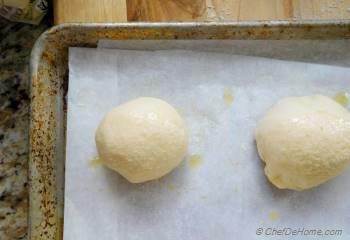 Shape each portion to balls, tuck seam side down and place on prepared baking sheet. Spray light coat of oil on all and sprinkle with corn meal/semolina flour. 7. Cover with loose dry kitchen towel. 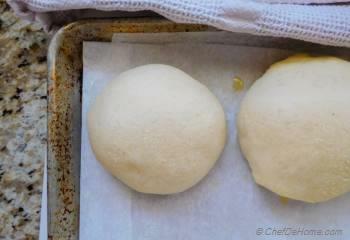 and let rise at room temperature for 1.5 hours or until dough doubles in size. 9. Then carefully lift and flip to cook other side for 5-8 minutes. 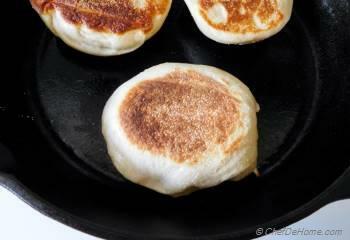 Transfer cooked English muffins to baking sheet and bake in oven for 5-8 minutes or until center has been cooked. Repeat step 8 and 9 for remaining muffins. 10. 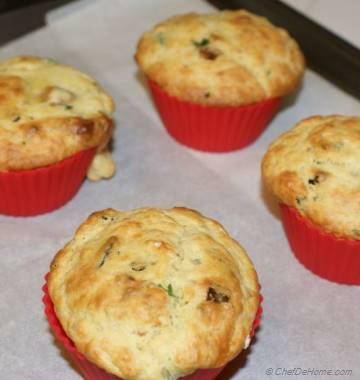 Once baked, transfer muffins to cooling rack and let cool for 30 minutes before serving. 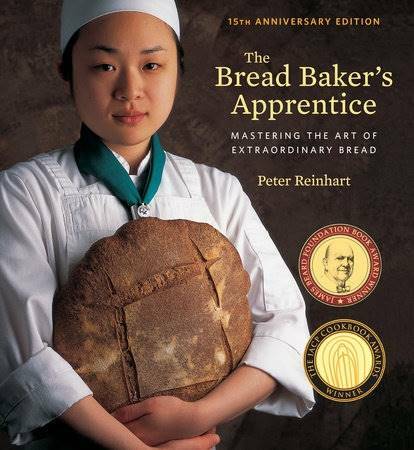 I only received The Bread Baker's Apprentice cookbook for review. There was no monetary compensation received. All opinions are my own. Recipe is adapted from the book. Thank you so much, these are fabulous! They are so fluffy and I will never buy those horrible things in the supermarket again! 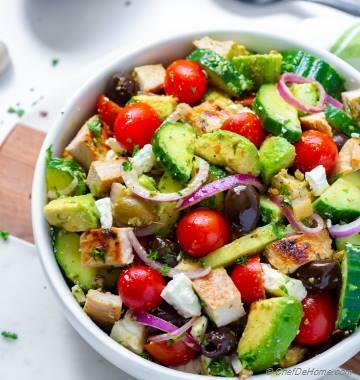 Easy recipe, worth the time it takes...good food takes time. Hi Kim, I'm glad you enjoyed muffins. I agree, good food takes time but it is so worth it because it is homemade, fresh and we know what went into it.